Organize and share restaurant reviews. Is there a better alternative to Restaurant Savant? Is Restaurant Savant really the best app in Applications category? Will Restaurant Savant work good on macOS 10.13.4? Restaurant Savant (RS) is specifically designed to hold restaurant reviews. It's very powerful, it can hold 64 trillion reviews, yet it's simple to use. Here's how it works: you gather reviews from sites such as Chowhounds.com, TV, Radio, Newspaper etc., and drag 'n drop them into RS. 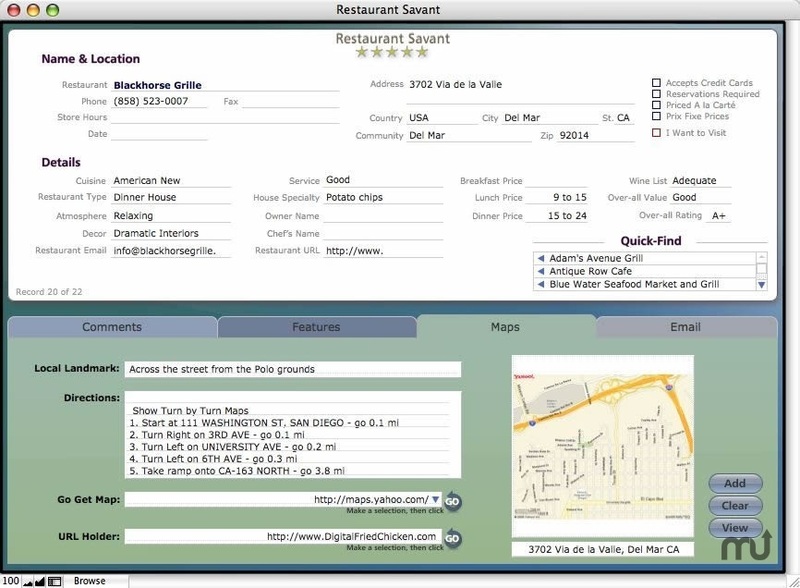 By entering information such as: Name, Address, Type of Restaurant, etc., you can organize your reviews in such a way as to make it easy to create a book or a quick list of reviews for a particular area you'll be visiting, or to easily invite a friend out to eat and include the directions via email. Restaurant Savant needs a review. Be the first to review this app and get the discussion started! Restaurant Savant needs a rating. Be the first to rate this app and get the discussion started!